PROVIDENCIALES, TCI, - InterCaribbean Airways is introducing new routes from Santo Domingo (Dominican Republic) to Aruba, Curacao, and Kingston (Jamaica). The TCI based airline, which connects 22 destinations and 14 countries in the Caribbean, will also be adding a larger aircraft to its fleet increasing its passenger and nonstop and direct flight capacity. The addition of routes and aircraft will continue to open up and facilitate travel around the region. According to a press statement issued by the company on July, 18, 2018, the services will be in addition to its nonstop services to the Virgin Islands, Tortola, St. Maarten, and Providenciales, Turks and Caicos Islands (TCI). The new destinations of Aruba and Curacao will also serve as new routes for the Virgin Islands with connections from Tortola via Santo Domingo. Direct flights from Tortola, InterCaribbean’s second hub, include services to San Juan, Antigua, St Maarten, Santo Domingo, Dominica, St Lucia, and Providenciales with connections to Kingston (Jamaica) and Nassau (Bahamas). Service commencement to the new destinations will be confirmed soon. 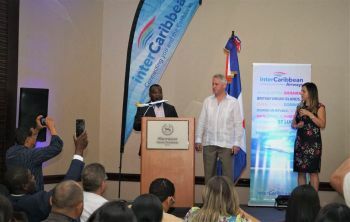 The announcement was made by InterCaribbean’s Chairman and founder, Mr Lyndon Gardiner, and the airline’s Chief Executive Officer (CEO) and Executive Director, Mr Trevor Sadler at a recent launch event hosted at the Sheraton Hotel in Santo Domingo. In his presentation to stake holders in the DR tourism and business sector and Caribbean tourism representatives from countries served by the airline, Mr Sadler drew attention to the full potential of the region not just as a tourist destination but as an important commercial and business market. "At InterCaribbean Airways, we know that the Dominican Republic currently leads the region as an economic engine and as a strategic commercial and business point. Our intention is to facilitate the opportunity through the introduction of these new routes,” said the CEO. Sadler spoke about the overall benefits of InterCaribbean’s nonstop flights from Santo Domingo to the 6 destinations and the onward connection to San Juan, Puerto Rico via Tortola. He also highlighted the importance of the routes that connect the DR and the Turks and Caicos Islands with the flights from Santiago, Puerto Plata and Santo Domingo. “InterCaribbean has a long-standing history and relationship with the Dominican Republic and we consider it a privilege to be serving the Dominican community, not only as a way to enjoy tourism elsewhere in the Caribbean, but also by being able to connect all Dominicans who live throughout the Caribbean," said Sadler. The company also plans to increase the number of passengers transported per year by more than 300,000 and aspires to continue its expansion in the region with the addition of an Embraer 145 Jet. The 50-seater ERJ145 will soon join the airline’s fleet of Twin Otter and Embraer 120 aircraft to serve more cities in the Caribbean with greater efficiency. "There is no doubt that each Caribbean island has its unique charm, and each place has an exclusive list of things to do and a variety of options which will continue to attract more and more visitors. We aim to be the airline to connect passengers with their chosen destination,” Sadler said. interCaribbean which has been connecting the Caribbean for 26 years, has also been working towards adding two countries to the destinations already served by the airline and will announce the new additions in due course. InterCaribbean Airways was founded in 1991 by Turks and Caicos native, Lyndon R. Gardiner. It started as a charter flight service but in the course of its development embarked on an ambitious program of expansion of international destinations by gradually adding larger aircraft. It currently flies to Antigua, the Bahamas, Puerto Rico, Jamaica, Haiti, Jamaica, Cuba, Dominica, Dominican Republic, St Lucia, St Maarten, Virgin Islands and TCI. Wat happen to St Vincent when are they going to start fly there .